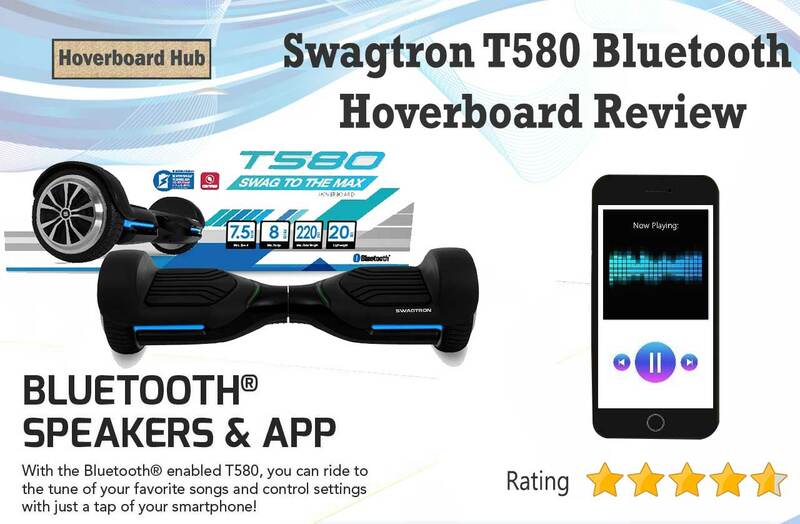 If you haven’t yet heard of Swagtron, you should know that it is one of the leading hoverboard manufacturing firms in the world. With over half a dozen of design models it ranks among the top 10 hoverboards of 2018. Coming on to the Swagtron T5 model, it is one of the better products which are best suited for the new riders. It is completely reliable and features an attractive design which can blow away your mind. The most preferred color is black because it looks classy and of high quality. However, you may even go for the white colored scooters because these are the same price as the black ones and have a shine which you will definitely adore. No more sparkling and no more fire issues, because the hoverboards we are talking about is 100% safe. These are certified by the world’s best Underwriters Laboratory. After passing almost 196 tests these have been accredited the UL2272 certifications. So you no more need to worry about that news of house fire and life loss due to hoverboard fires because these boards are made fire resistant. This means that you do not need to buy separate hoverboards for yourself and your kids. It is all in one and is equally good for all age groups. However, there is a weight limit and goes well for young people with small feet. There are two different riding modes available. One is the learning mode, good for the first riders and kids while the second is the standard mode fit for the ones who are well acquainted with riding free. The price difference between these modes is that there is a certain speed limit to which you can go in the learner’s mode. On the other hand, you can ride about freely in the standard model. You might wonder how fast you could go on a Swagtron T5 electric scooter. Well, these are fast enough and has a maximum speed limit of 7 miles per hour. If you get used to riding, you can imagine the speed you can take your scooter to. That will be the ultimate fun to fly across the lane with an incredible speed to beat the crowd. Each and every hoverboard has a maximum weight capacity and the hoverboards are not really suitable for people beyond that weight. For Swagtron T5, the weight limit is as high as 190 pounds. So we see that this range is much lower as compared to standard hoverboards which give at least 220 pounds limitation. But nevertheless, if you fall under the weight limit, this scooter can prove to be your friend and last longer than others. Along with great self-balancing features, they come with non-slip foot pads. That is, the moment you keep your foot on the hoverboard, you will not feel a slipping tendency, unlike others. They are very stiff and offer great balance even if you are riding it for the very first time. These hoverboards are capable of climbing great inclinations and that could go as high as 30 degrees, which is appreciable. The roller coaster ride it is capable of giving sounds terrific in the first go and super smooth in the next. The Swagtron T5 electric scooters do not take more than 2-3 hours to charge up its battery. They are quick and long-lasting. The patented battery protection makes it suitable for use. These are of prime quality and manufactured by some of the world’s trusted battery manufacturers. You no more need to worry about your hoverboards posing a threat of fire due to overheating or sparkling. It is all free from leakage and short-circuiting. The good thing is there have not been any complaints regarding its batteries so far. What’s more to Swagtron T5? Wait, if you think that’s it, then you are probably wrong. There’s definitely more to the Swagtron T5 model with powerful and upgraded features of system and battery indicators. This means that you can know the exact amount of battery percentage available at a particular moment in your hoverboard. Also, you can figure out the condition of your board by the system indicators. All are in smart indicators format and gives a cool finish to the structure it possesses. We have already talked about its cool structure. When it comes to the looks, they are well maintained with outstanding emblem sculpted on each of its pedals. The design is doubtlessly unique and modern and is small in size. Being small in size makes it light in weight and portable to be easily dealt with by the young kids as well. You need not think any more about the hikes in hoverboard prices because now you can get the OXA boards in just $300. Whoa, nothing could be better for the hoverboard lovers tonight. Overall, these are quality electric scooters and come from one of the very famous brands. They are best for young riders who have a weight less than 290 pounds. The speed is commendable and can easily go about at high speeds. The range is good as well and is ideal for long rides. The good thing is that it takes less time to refill the charges and thus is quick and smart. The style and structure is another attractive feature which has made them demandable. It is always a good investment to be made.